Pretty Little Studio's newest collection, Document Life, is available for Pre-Order today. Don't miss out! Happy Wednesday, y'all! It's been a crazy busy week in my neck of the woods, and I feel like it's just getting started. So, I'm going to jump right into the reason for today's post. I've got a couple of masculine cards up on the Pretty Little Studio blog this am. Guy cards are ever so difficult for me; but I'm really liking the way these particular ones, made with my dad's and my brother's birthdays in mind, turned out. Enjoy! I started these cards by anchoring 2-1/2" x 5-1/2" pieces of one of the Bohemian Dreams 6x6 Paper Pack prints, with black-threaded, straight, machine stitches, against the right sides of my white, cardstock, card faces. I also added a little additional, black stitching to the left sides of the card faces for added interest and secured a couple of 3x4 Crisp Air Pocket Cards, with even more stitching, in the centers of each. I then used Bohemian Dreams 2x4 Paper Pack prints to create tags, which were backed with cheesecloth and popped up, with foam tape, over the pocket cards, simply by hole-punching their top centers and framing them with rings, die-cut from other 2x4 Paper Pack prints. which trails down to hold a couple of Feather Die Cuts, popped up with foam tape. The "PERFECT DAY TO DREAM" Stories & Tales Word Sticker was popped up with foam tape in the bottom half of the tag and anchored, at its left end, with a Fall Memories Flair Button. 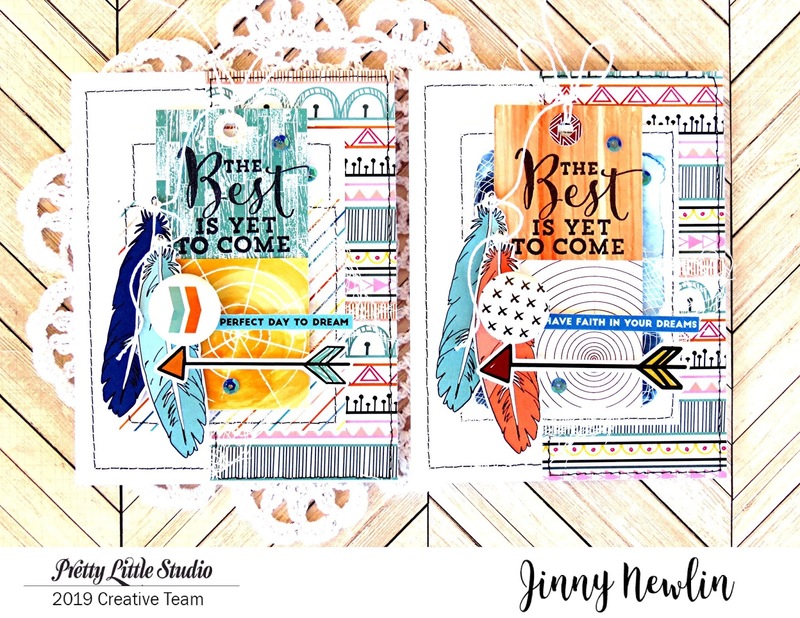 A Fall Away Arrow Die Cut, popped up with foam tape, and trio of blue sequins, from the Falling Leaves Sequin Mix, complete the look. I went with the exact same look for the second card. and laced with another length of white string, tied in a bow, through yet another pretty print, die-cut in the shape of a ring. It's long end, just like the one above, holds a couple more Feather Die Cuts, popped up with foam tape. 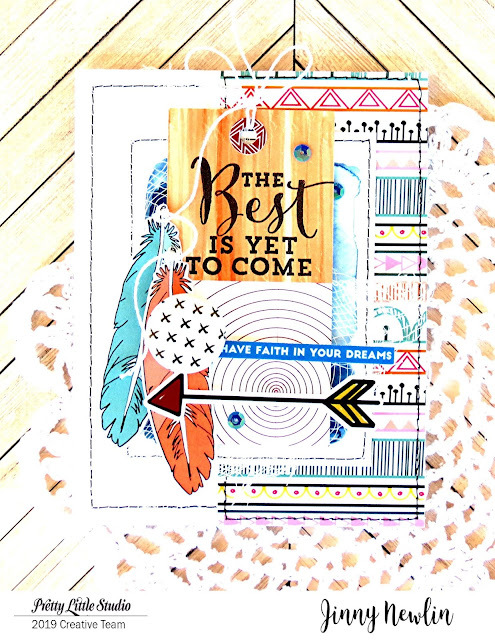 I used another Stories & Tales Word Sticker to add the secondary, "HAVE FAITH IN YOUR DREAMS" sentiment, anchored, at its left end, with a Fall Favorites Flair Button. Another Fall Away Arrow Die Cut and the same trio of blue, Falling Leaves Sequin Mix sequins complete the look. 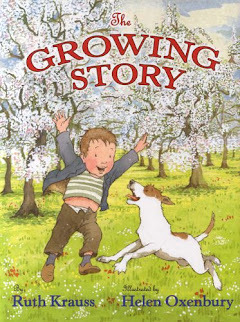 Thanks, as always, for visiting on this busy, posting week! Be blessed! Welcome to the work week, y'all! We have a bit of a shorter week due to the Easter holiday this week, and I couldn't be any happier. These last couple of months of school have been brutal. It's so hard to keep up with everyone and still find time for my own sanity. The Midwest Parent Educator's Conference, which takes place the first part of April back in Kansas City, used to carry me through these tough, final days of the school year and empower me to end the year with style. The El Paso Homeschool Conference doesn't take place for a couple more weeks; and while I'm all set to attend, it's past due in my book. So, I'm trying to "just keep going" on nothing but fumes. Anyhow, I know that you didn't come here to read my of my woes. 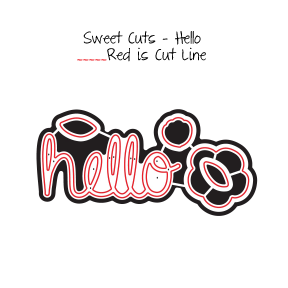 So, let's dive right into one last project, for now, showcasing Paper Sweeties' April Release, the Hello stamp set and its coordinating, Hello Sweet Cuts die. Woohoo! and Tackle Life One Cup at a Time "Hang in there... a cup of coffee solves everything!" sentiment. I then used it to overlay a slightly larger, blue, Ikat print and secured them both, with gold-threaded, straight, machine stitching, to a Night of Navy, cardstock frame, popped off the surface of the white, cardstock, card face with foam tape. The scallop frame, from A Friend Is, was glitter-gold-embossed on a white, cardstock die cut; adhered in the center of the prepped piece; and filled in with a number of stamped images, beginning with the coffee cup, from Coffee, Yes Please, which was stamped, in Jet Black ink, on a white, cardstock die cut; paper-pieced; and popped up with foam tape. The flower, which was leftover from my Paper Sweeties April Release Sneak Peek post, received an extra dose of shine with Clear Wink of Stella. It, too, was popped up with foam tape. 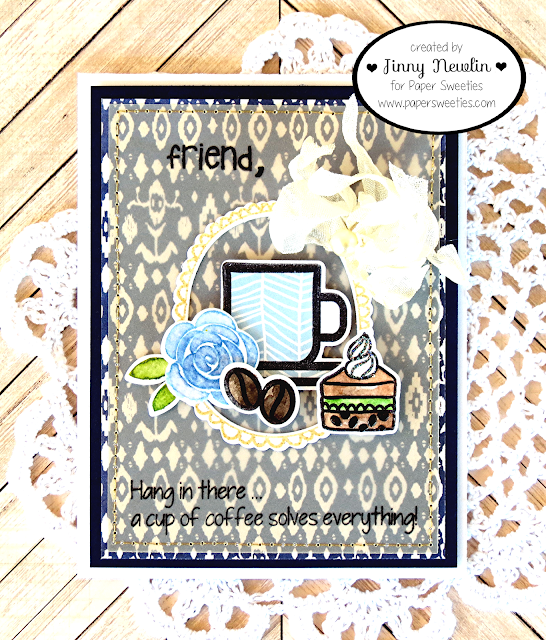 The beans and pastry, both of which are from the But First, Coffee stamp set, were stamped, in Jet Black ink, on watercolor paper die cuts; watercolored; and, once again, popped up with foam tape. The latter was done up right with Clear Wink of Stella, Dazzling Diamonds, and even Glossy Accents. A Frosting seam binding ribbon double bow, studded with a single pearl, completes the look. Be sure to stop by the newly-designed shop to pick up your April goodies TODAY! Just click on the images below to be taken right to them. Thanks so much for humbling me with a visit! Have a blessed week, friends! 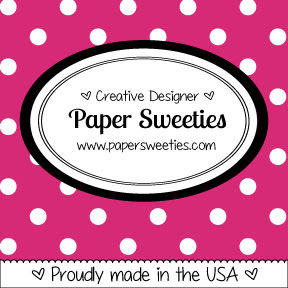 Welcome back, Paper Sweeties' fans! I've got another card to showcase our newest release, for you all, today. Enjoy! 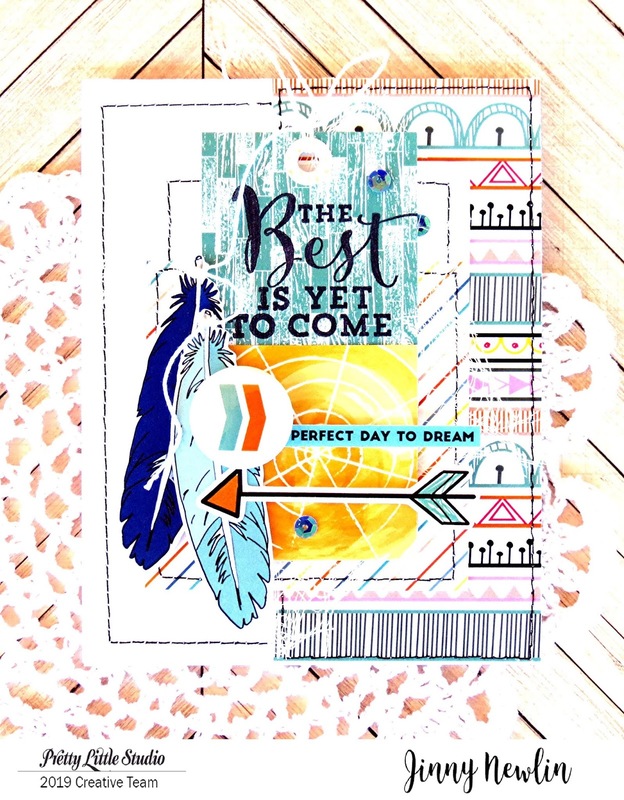 I started this card by stamping the long, "hello, sunshine, you make me smile" sentiment, all of which can be found in the new, April Release, stamp set, Hello, in Barn Door Distress, Daffodil Delight, and Jet Black inks, on a 3-1/2" x 4-3/4" piece of watercolor paper. The sun and cloud, both of which come from Somewhere Over the Rainbow, were stamped in Jet Black ink. The sun was stamped on the card face itself; and the cloud on a watercolor, paper die cut. They were both then watercolored. The cloud was popped up with foam tape; and everything was splattered with the same yellow watercolor used on the sun itself, as well as Pure Black and Titanium White, acrylic paints. The entire prepped piece was then framed with Brilliant Blue cardstock and blue-threaded, straight, machine stitches, before being wrapped, three times, with a length of Baker's Twine, tied in a bow just right of vertical center, and popped up, with foam tape, in the center of a white, cardstock, card face. 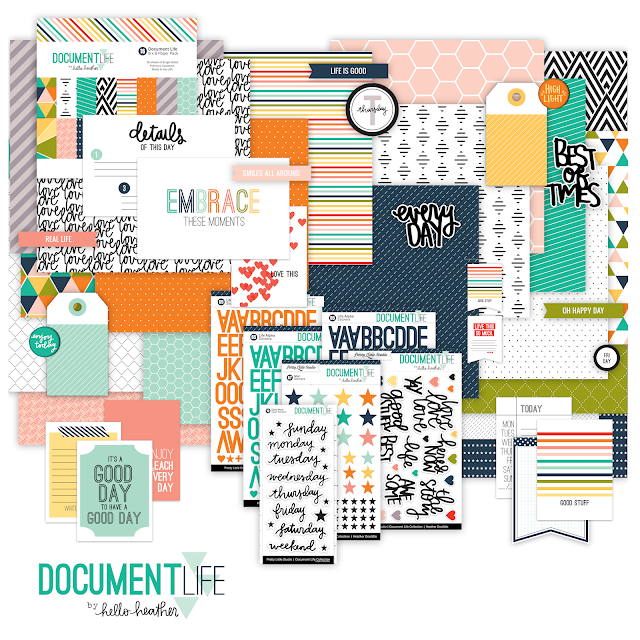 I look forward to seeing you all right back here tomorrow for the final day of April Release projects from Paper Sweeties. Until then, thanks for stopping by today! Hugs! Evening, y'all! I hope your weekends are off to a great start. We went to the lake today, mostly because my eldest needed to get some water samples for his biology lab... not that we didn't want to go. There are just a lot of things nagging for attention at home; but we all really did enjoy the afternoon playing in the water, and it was nice just to get away from all the reminders. Anyhow, I'm popping in today to share the start of a trio of projects, highlighting a brand new Hello stamp set and coordinating Hello Sweet Cuts from Paper Sweeties. Let's just dive right in. I started this card by running a 3" x 4" piece of white cardstock through my Big Shot to get a little dotted texture. I then trimmed its bottom edge, from top to bottom, with a bright blue, medallion, patterned paper; strip of gold cardstock; and my favorite, watercolor, star print. Everything was then anchored, to the white, cardstock, card face, with white-threaded, straight, machine stitching. The space between the gold cardstock and my favorite, star, patterned paper was wrapped, three times, with a length of white string, which I tied, in a bow, just right of vertical center. I then die-cut the "hello" sentiment, using the new Hello Sweet Cuts die, from the same gold cardstock found above the bow and framed it with a heap of gorgeous, blue flowers. 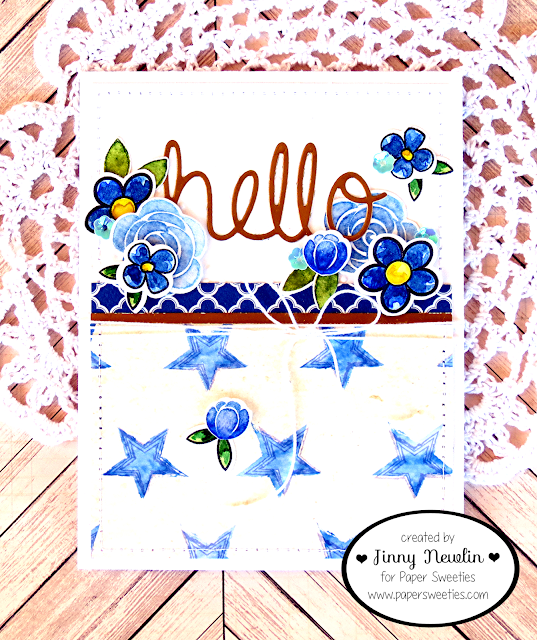 The largest flowers, from the new Hello stamp set, were dual-stamped, in Bashful Blue and Brocade Blue inks, on watercolor paper, just to make the ink a little more malleable with water. I added Brilliant Blue ink to that lineup for the Hello buds, including the one trailing down the left-side tail of the string bow. The unlined, Hello leaves were treated in the same way with the exception of being stamped in Lucky Limeade and Garden Green inks rather than the blue inks. The black-outlined flowers and leaves, from the Hello Spring and Planner Series: All Occasions stamp sets, were stamped in Jet Black ink and watercolored. All of these tidbits were then die-cut using their coordinating dies and adhered, in their respective locations, some with foam tape, amidst a quartet of Blue Raspberry sequins, to complete the look. 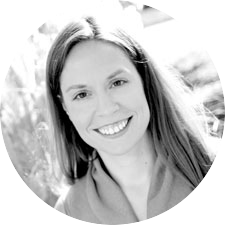 I am a former kindergarten teacher turned wife of 17 years to BJ and stay-at-home, homeschool mommy to three beautiful gifts from God, Ezekiel (15), Adina (10), and Kaden (5). When I'm not taking care of or playing with my family, you can find me cooking, baking, gardening, sewing, and of course, papercrafting. My love for the latter started over fourteen years ago, but my love for creating began before birth. I feel overwhelmingly blessed by all God has given me and know that if I continue to keep my eyes on Him, He'll keep me soaring. All images are copyright Jinny Newlin. Shared images are not to be copied, without written consent, and/or used for publications or design contests. If you find yourself inspired, and I hope you do, and would like to share your idea on the internet, please note where you found the original idea. Thanks!